I was attracted to this novel by hearing an abridged serialisation on the radio – the confiding intimacy of the first person narrative worked really well in this form, as does the selection of dramatic incidents and turning points in their relationship. This novel worked well as a piece of storytelling – it must be 3 times the length of Hemingway’s own account of that period of his life in A Moveable Feast, a memoir in the form of a series of vignettes. McLain acknowledges that she drew on the memoir, which I read afterwards for comparison, and I did recognise a lot of the events Hadley describes. I think it is quite a challenge to write fiction based on real people’s lives – do you write about your “characters” as you believe they were or as you would have liked them to be? Hemingway’s Hadley sounds too good to be true, (he described her as too good for him), but by telling her story in this way, McLain makes her sound a bit more real and less saintly, and this actually makes her more likeable. At times I felt she was rather too willing to sublimate her needs to his, but this seems quite realistic in the context of the time. She spends a lot of the novel seeming rather passive, even dull, but then we get glimpses of someone rather more assertive and prepared to stand up for herself – in the end, when put in an impossible situation, it is Hadley who has the strength to make another life changing decision for herself and her son. Her love for him also doesn’t stop her voicing her opinions of his writing when needed, when he writes a book satirising a friend’s work and Hadley tells him how wrong he is to even think of trying to publish it. From Hemingway’s account we know that Hadley was an enthusiastic reader, who particularly liked the work of Henry James and compared other work to his, not always favourably. I think McLain misses an opportunity to make Hadley more interesting by mentioning Hadley reading frequently but not what she is reading – this is something I want to know about fictional (or real) bookworms in books. The portrait of Hemingway in The Paris Wife is also interesting – his public image is often based on him in late middle age – here he is in his early 20s. We see him at his best and most romantic at the beginning of the novel, and becoming increasingly selfish and dishonest later – like his wife, we see his more appealing, sweet side, and also some of the damage that has been done to him by his wartime experiences, and as things go wrong, we also see his more obnoxious side. Other characters in the novel are less well drawn, apart from the predatory Pauline. Some of the other writers don’t emerge beyond being names on the page, and McLain doesn’t add much to the descriptions of these people than what is mentioned in A Moveable Feast. I was also struck by the fact that a novel set largely in Paris gives little feel for the city or its native residents. This reflects the memoir, perhaps, in which Hemingway describes hanging out with other expats and English speaking writers the whole time, but it was another area in which I thought McLain could have actually made up and embellished Hadley as a character. The Paris Wife made me want to read/reread some of Hemingway’s work and perhaps that of some of the other writers mentioned. Overall, this novel has some faults and frustrations but I thought it was a great, page-turning read. 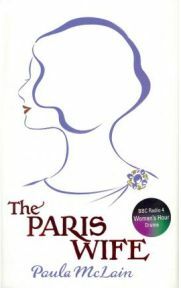 I received a free copy of The Paris Wife via the Amazon Vine programme. 4 Comments on "The Paris Wife"
V nice review — I appreciate some of the ‘rough patches’ as you saw them. Being a huge fan of one of Hemingway’s ex-wives (Martha Gellhorn), I’m more on their side than his, so I’ve been curious about this — but I’ve seen reviews that make me think I’ll drop this lower on my TBR. I’ve reserved this book at the library and can’t wait to read it. I’m very curious to see what Hadley is like from a different perspective. In A Moveable Feast, Hemingway surprisingly comes across as very romantic (my image of him was very different) so it’s made me wonder how accurate his portrait of those years is since he is writing about them after 30 odd years. I’ve also reserved The Sun Also Rises, so I’m hoping to read them one after the other. Hi Sakura, thanks for your interesting comments. I read The Sun Also Rises a long time ago as part of an American Lit course at university, and reading these two books did make me want to rearead it too. I agree that Hemingway comes across as rather romantic in A Moveable Feast. I’d think any one perspective on the material, even just after events, would only be accurate on someone’s own terms, ie this is what Hemingway thought happened but Hadley or F Scott Fitzgerald or Gertrude Stein might have seen things very differently! II’d love to hear what you think of Paris Wife and Sun Also Rises when you have read them! I thoroughly enjoyed this – I have read most of Hemingway’s novels (though many years ago). However, for some reason I missed out A Moveable Feast, perhaps because it seemed a slighter work. Therefore, most of the events described here were new to me. It certainly maintained my interest all of the way through, and I thought the characters were fairly convincing. I agree that it is a good read.